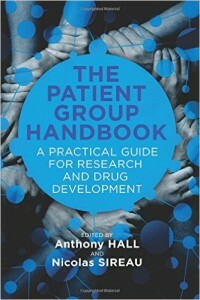 The Patient Group Handbook – now in print! All royalties are donated to Findacure, the charity we set up to help rare disease patient groups. Please buy the book and spread the word among your networks. – How to set up and manage a patient group: US and UK perspectives. – How to build an international research consortium. – How to promote basic research. – How to engage with academia for drug discovery. – How to engage with industry. – How to set up a centre of excellence. – New funding strategies for clinical research. – Crowdfunding for rare diseases. – Practical thinking to win bids. – Orphan drug legislation and adaptive licensing. – Early interaction with regulators and parallel scientific advice with health technology assessors. – How to navigate the regulatory process. – Empowering children to become involved in the research agenda. – Clinical efficacy measures and surrogate endpoints. – Setting up and running a clinical trial. – How to interact with government and lobby for change to the clinical trials system. – Patent protection and ownership of patents. – Engaging patients and carers online for clinical trials. If you are involved in patient groups or rare diseases in any way, then this book will provide valuable reading.